A Visa Debit card, also known as a Visa check card, is a debit card that works like a check, only better. When you make purchases, the amount is deducted directly from your Southwest FCU checking account. But you also enjoy added convenience and security protections. Just use your Visa Debit card when you’re ready to pay. It works fast, so there’s no need to write checks or fumble for change. Get cash back at the register – you’ll save on trips to the ATM and can leave your checkbook at home. Because it’s accepted at millions of places worldwide, you can use it for nearly anything, including monthly bills, dining, gas and automotive services, groceries, online purchases, prescriptions, and more. 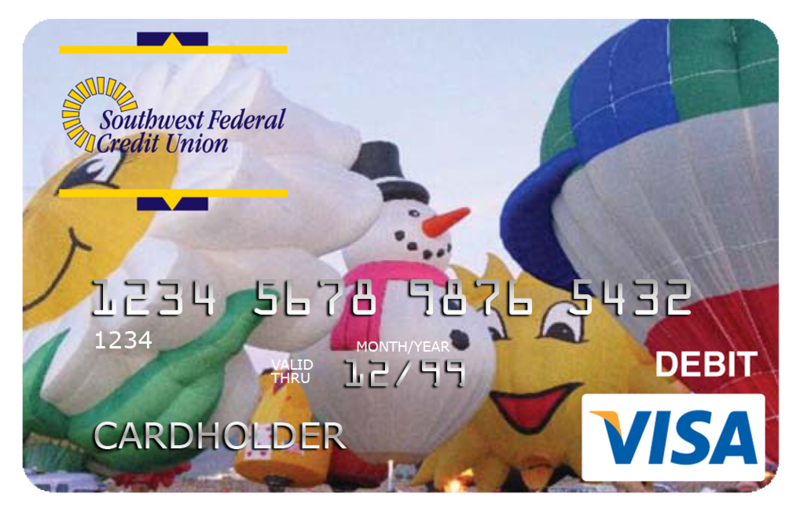 And you can access your money fee-free at CU Anytime, CO-OP Network, and Bank of the West ATMs nationwide. Debit card transactions are automatically deducted from your checking account and typically posted within 24 hours of your purchase. So you can check your updated balance and transaction record here on Southwest’s website or by phone. In addition, every month you’ll also receive a checking account statement that details your purchases, including merchant name, location, date and amount. So it’s easy to see where your money goes. Gain peace of mind with Visa’s extra security protections. Visa’s Zero Liability Policy*, which protects you from unauthorized charges. Any funds taken from your account due to fraudulent use will be returned to you. As a result of increased Debit Card Fraud and our concern for your protection, you will be required to use your PIN (Personal Identification Number) instead of your signature for certain debit card transactions. For questions or concerns or if you have been denied, Call 505-243-6751 during normal business hours or 1-888-526-0404 after hours. You’ll receive these same security protections when you use your Visa Debit card for online, phone and mail orders or for purchases at merchants that do not require a signature.